Audiobook and audio entertainment provider Audible.com.au has launched its latest multi-channel integrated brand campaign, featuring local actor and comedian, Rebel Wilson, as the self-appointed ‘Minister for Words’. The campaign, developed by Emotive with Poem handling PR and talent amplification, empowers Australians to rediscover the power of the spoken word and ensure words aren’t being misused or neglected. The mock political campaign reflects the current political and cultural climate and follows Wilson on the campaign trail to ‘Make Words Great Again’ in Australia. It showcases how audiobooks can reintroduce Australians to substantial and meaningful words that inspire, entertain and expand their minds, whether that be on the morning commute, at the gym or as a way to relax and reduce screen time before going to sleep. According to research commissioned on behalf of Audible, Aussies are keen to broaden their minds and to feel inspired by the words they consume, with 80 percent of Australians feeling their conversations are becoming more negative, citing dishonest politicians (46 percent), depressing news (43 percent) and negative leaders (39 percent) as the most common reasons. Aussies are also looking to be positively impacted by the content they consume in 2019, with over half of those surveyed looking for more positivity or inspiration in the words, stories and public figures they come into contact with throughout the year. The video explores how banal conversation, fake news, poorly chosen language, and uninformative social feeds can bring people down and leave Australians feeling empty and uninspired, while Audible offers an enriching alternative. Wilson is joined by several familiar Aussie faces in cheeky cameo roles such as comedian and national radio host Tanya Hennessey as an unenthused gym goer, WSFM breakfast radio host Brendan “Jonesey” Jones reprising his role as a chauffeur, and comedian Jordan Raskopoulos as an avid Audible listener who has learned about 17th-century agricultural practices. The video declares that Australia deserves better and proposes that we choose the words we listen to wisely. Audible and Emotive built the campaign on the insight that in a world of fake news, mindless social scrolling and uninspiring leaders, the right words are powerful tools that can transform our mind and mood. So, isn’t it time we make words great again? The branded content will appear in multiple formats across TV, cinema, digital, social media and influencer channels. Audible.com.au country manager Leanne Cartwright-Bradford said: “This campaign was born from the desire to inspire people and remind them of the power of great words, especially when we live in a climate where words appear to have lost their power and value. “Audible is here to reignite a love and passion for words that inspire, entertain and educate. Self-appointed minister for words Rebel Wilson added: “Australia is a nation of great speakers, from Gough Whitlam to Magda Szubanski, but we need to remember uninspiring words can really bring us down. 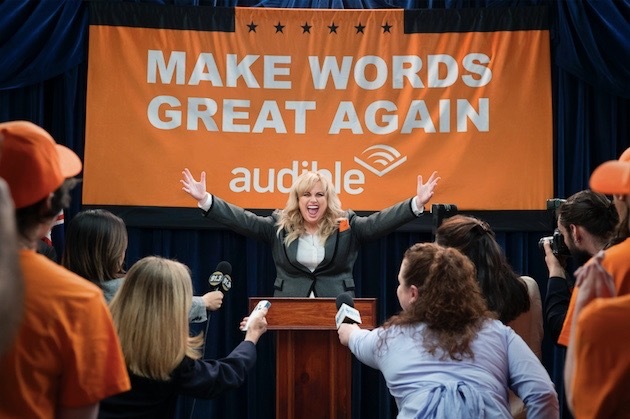 ‘Make Words Great Again’ represents Audible.com.au’s fifth local campaign. In addition to the hugely successful ‘Said I Read You… But I Lied‘ (starring Michael Bolton) and Listen To Your Book, the brand also showcased how audio can help ‘Grow Your Mind’ in late 2017 and previously partnered with The Equality Campaign to launch ‘Listen To Love’, an original audio series investigating equal love and voiced by local celebrities and everyday Australians.